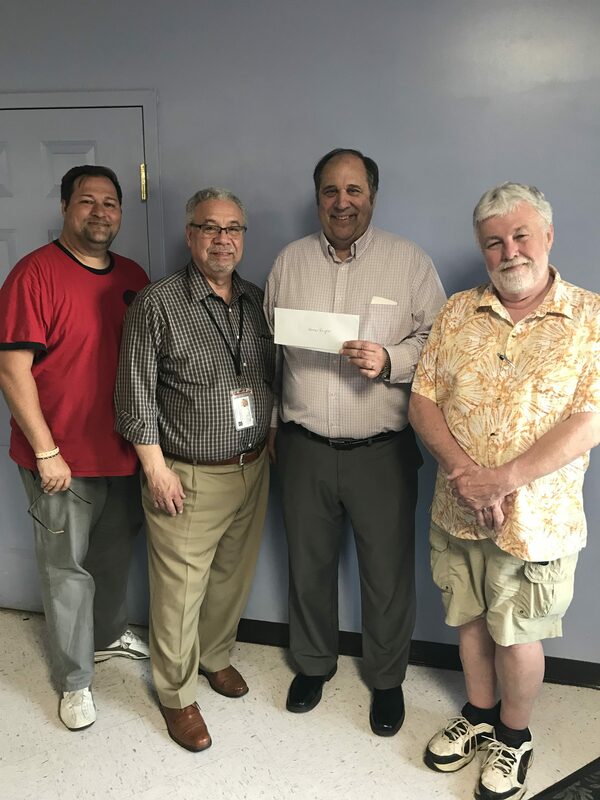 On September 26th, 2018 the Oswego Elks Lodge 271 presented a check for $1500 to Honor Flight Syracuse. 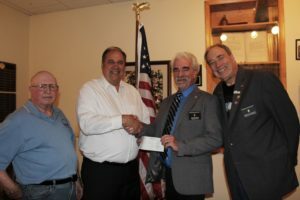 The funds were donated from the Elks Grand Lodge Anniversary Grant. Many thanks to the Elks for their tremendous support of our mission to honor our nation’s veterans! From left to right are: Bernie France, Elks Veteran and Honor Flight Alumnus; John Hall, Board of Directors Honor Flight Syracuse; Nelson Metz, Elks Exalted Ruler; and James Dillabough, Elks Veteran Co-Chairman. Posted in News | Comments Off on Join us for Mission 12 Saturday, September 29! The Syracuse Brigadiers Alumni Association recently held a Bingo benefit at the Cicero American Legion and and named Honor Flight as the beneficiary of the proceeds. Many thanks for their generous donation of $2,500 to support our mission to honor and thank all veterans! AXA Makes 2018 Donation to HFS! What an awesome group! 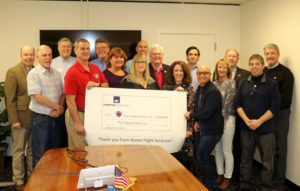 Honor Flight Syracuse board members gathered with AXA US staff yesterday to thank them for their generous donation to our mission. In addition to providing funds as one of our major sponsors, AXA staff dedicate hundreds of hours as HFS volunteers throughout the year. 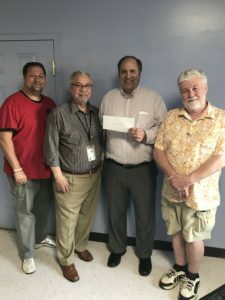 Posted in News | Comments Off on AXA Makes 2018 Donation to HFS! Key Bank Donates to HFS! We are blessed to have the support of amazing community groups. We recently met with leadership from Key Bank to receive a generous donation in support of our mission to thank and honor our community’s veterans. 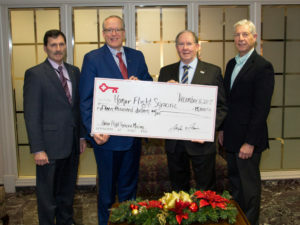 Pictured left to right are: Key Bank Regional Sales Manager Joe Messineo, Key Bank Senior VP Stephen D. Fournier, HFS Board Vice President John Paddock and HFS Development Committee Member Gary Livent. THANK YOU Key Bank! Posted in News | Comments Off on Key Bank Donates to HFS! On Wednesday, 8 November, the CNY Veterans Recognition Foundation is holding their 4th Annual Veterans Day Dinner at the Welch Allyn Lodge. Known simply as The Lodge , this beautiful facility lies on the pristine wooded campus of Welch Allyn’s headquarters in scenic Skaneateles, located just 20 minutes from downtown Syracuse. It provides the perfect setting for this important and memorable event. So please, mark your calendars!. A portion of the proceeds from the event will benefit the mission of Honor Flight Syracuse. The Veterans Day Dinner honors the men and women who have served and continue to serve our country, with an entertaining evening of recognition, silent auction, and distinguished guest speakers. Dan Cummings of WSYR News Channel 9 and an alumni of Mission 04 will be the evening’s Master of Ceremonies. This year’s Keynote Speaker will be Major General Michael E. Dunlavey. After graduating from Notre Dame, General Dunlavey served for four years in the United States Army, with assignments in Germany and Vietnam. He then earned his law degree and went on to distinguish himself as both an attorney and a judge in Pennsylvania. After the 9/11 attacks, General Dunlavey was recalled to active duty. Based on his unique combat, intelligence, and legal background, he was chosen by the Secretary of Defense to design an intelligence gathering program to help prevent further attacks on the United States. Additionally, General Dunlavey has dedicated a significant amount of his time to a number of organizations that support Veterans suffering from Post-Traumatic Stress Disorder and Traumatic Brain Injury, and to organizations that provide training and workforce development services for Veterans transitioning from military to civilian life. Tickets and more information available at www.cnyvrf.com. Help us fill future missions! Many of you have generously volunteered to be a guardian on an upcoming mission. Well, here is your chance to help Honor Flight AND become a guardian! We urgently need veterans to fill future flights. As the World War II generation ages, we are losing more and more of these heroes every day. Many of them have not participated in an Honor Flight for various reasons: they aren’t aware of the opportunity, they think it is too costly, they worry about their health, they are unable to apply, or they simply don’t believe that they deserve to go. You can help! FIND a World War II, Korean, or Vietnam era veteran and help them apply. Talk to them about the experience – it is completely free of charge for the veterans. Our health and safety team carefully work with each veteran and guardian pair to ensure the veteran has a memorable and safe experience. All veterans, regardless of when they served, where they served, or if they saw battle deserve this opportunity to be thanked for their service. Find a veteran, help them apply at HonorFlightSyracuse.org or by calling us at 855-433-5633 and then offer to travel with them as their guardian. PLEASE help us fill future missions by applying to our brief wait list today! Posted in News | Comments Off on Help us fill future missions! 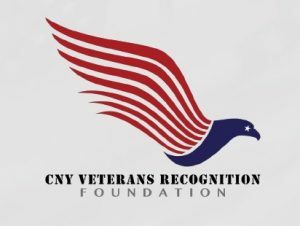 On November 9, the CNY Veterans Recognition Foundation is holding their 3rd Annual Veterans Day Dinner at the newly restored Marriott Syracuse Downtown. A portion of the proceeds from the event will benefit the mission of Honor Flight Syracuse. The keynote speaker will be Dr. Mike Haynie, Vice Chancellor of Syracuse University. Dr. Haynie is responsible for Veteran and Military Affairs. Tickets and more information available at www.cnyvfr.com. Central NY continues to be supportive of our mission to honor the members of America’s Greatest Generation and we wouldn’t be here today – Mission 008!! – without the amazing support of terrific donors and volunteers. 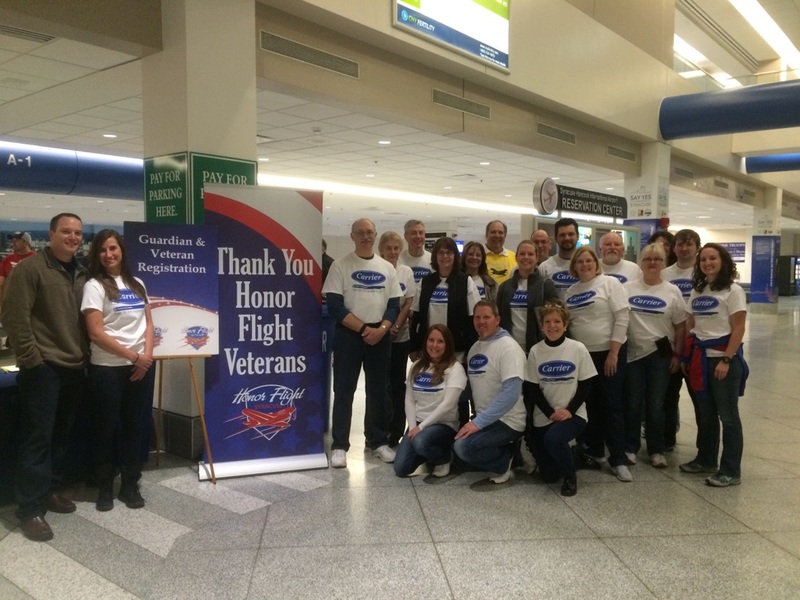 Recently, Carrier Corporation has joined Honor Flight Syracuse, not only as a corporate sponsor, but also by contributing volunteer hours and much needed manpower! Rallied internally by John Hall, manager sales engineer development, Carrier volunteers have joined committees, attended the Welcome Home, helped move wheelchairs and more! John was inspired to do more after traveling on Honor Flight as a Guardian for his father. Thanks Carrier for your commitment! M&T has also been a strong supporter since Mission 002. In addition to strong financial support, the M&T employees have enjoyed supporting the Welcome Home celebrations and cheering on our returning heroes. We are especially grateful for the strong contingent of M&T employees that meets us down in Washington, DC and spend the day assisting with the task of loading and unloading 80 wheelchairs at each of our stops! Saturday, October 1st marks Honor Flight Syracuse’s Mission 08! We are looking forward to taking these veterans on their mission to visit their memorials in Washington, DC. Everyone is invited to our Welcome Home celebration for these heroes! Please arrive at Syracuse Hancock International Airport by 6:00 p.m. Free parking as available will be in the overflow parking (turn LEFT at the light as you come onto the Airport grounds). Once filled, parking will be available in the pay lot and garage. Weather pending, the plane will land to a water-cannon salute, visible from outside the South Terminal. Proceed inside and cheer for the procession of veterans, led by the Syracuse Scottish Pipe Band and SU ROTC, Civil Air Patrol and Naval Junior ROTC Color Guards. The brief Welcome Home Ceremony will feature the Tom Dooley Choraliers and remarks by Bill Smullen, Director of National Security Studies at the Maxwell School of Citizenship and Public Affairs at Syracuse University and former Chief of staff for Secretary of State Colin Powell. Posted in News | Comments Off on Mission 08 is here!